Hotel De La Barriere, Chabanais. Le Cafe de Commerce, Rochefoucauld. Le St.Bernard Pizzeria and Restaurant, Brossac. 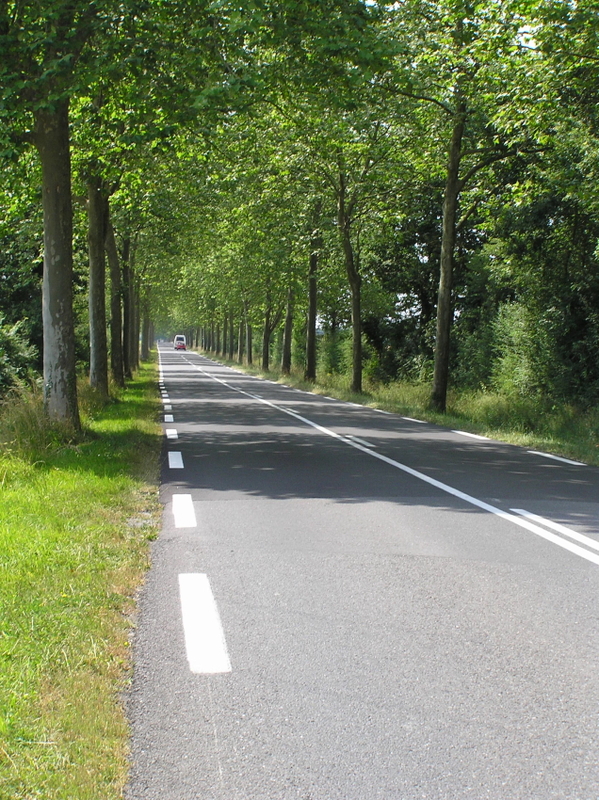 Another iconic image of France must be straight roads with a row of evenly spaced trees down either side. However what is their origin? Straight roads are associated with the Romans and certainly some roads in France owe their origin to the Romans, but any trees planted along these straight roads could not have been planted by them as they would have died long ago. The other popular explanation is that it was all down to Napoleon and he was instrumental in increasing the road network in France but the notion that he wanted the roads to be tree lined so as to provide shade for his marching troops is very often cited in articles but without much evidence. It seems that every article relies on all the other articles and so the notion is perpetuated and becomes ever more accepted. 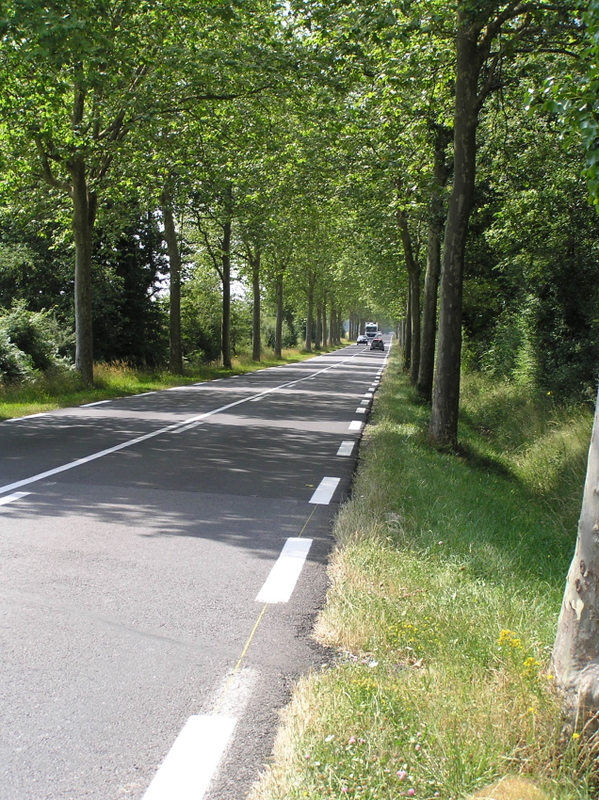 If you think about it the planting of trees along quite wide roads is not going to result in much shade for at least 30 to 50 years depending on how quickly the trees grew so Napoleon’s troops would certainly never have benifitted from the shade. From my searches through the internet library I have found some worthwhile information and it seems that road building was well underway before Napoleon put in his three centimes. The major players in this were Orry and Trudaine and the work was set in motion around 1738, Here is an extract from an article which details this phase of road construction in France. When Louis XIV died (1715), the roads of the kingdom he was leaving to his successor were in a dreadful state. This was a major bottleneck for the growing economic and administrative activities. The controleur général (finance secretary) Orry and the intendant Trudaine decided to repair the old roads and build new ones where carts and coaches could travel fast. Reach these objectives, Orry created the corvée des chemins (June 13, 1738) which gave the governors the possibility to force the peasants to work for the reparation and the construction of roads several days a year (766). After 1743, Turdaine took care of the operation, followed by his son who based his effort on the constitution of a corps of engineers dedicated to the construction of transport infrastructures. The preliminary tasks were over by 1750 and the most important construction operation ever undertaken in France was about to begin. The roads from Paris to the main seaports were to be 19.5 meters large, the other important roads were to be 11.8 meters large (767). On each side of the roads, a ditch was to be dug and trees planted (768). 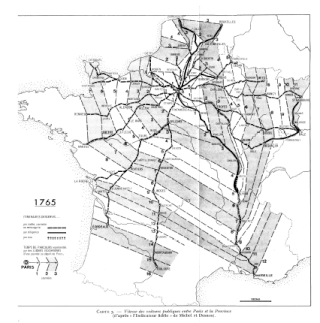 The corvée des chemins was to be ended by Turgot (February 6, 1776) and the roads constructed after that were smaller as many complained that they were too good and expensive for crossing some empty country. The engineers replaced the old zigzagging roads by straight lines which reduced travelling time, made the roads safer, easier to take care of and provided a strong rational to cut through people estates instead of negotiating (769). Paved roads were very expensive and were only common around Paris and next to the major urban centres. The rest was simply covered with gravel. Moreover specialised workers were difficult to find out of Paris. Most roads had been constructed by unwilling journeymen drafted by the corvée. Moreover, the engineers were not too interested by roads, they preferred bridges because they were more complicated (770). Despite important innovations, the roads network turned out to be nearly as fragile as the old one and required constant fixing and maintenance (771). The corvée was only available during spring and autumn. A road damaged during winter could spend months before being repaired (and thus be even more spoilt). Even though it faced major issues, the French road network was generally loaded by foreign visitors (772). 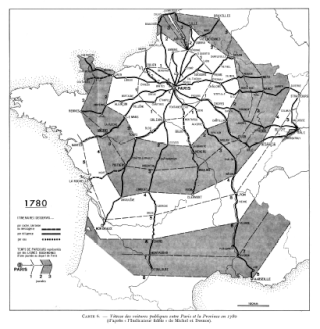 By the end of the monarchy, there were about 25,000km of major roads in France. This highly centralised network was mostly constructed during the last third of the 18th century (773). The so-called military roads that lead to the eastern frontiers reveal that favouring trade was not the only reason for the construction of the network. A side effect of these constructions was the realisation (mostly after 1743) of numerous and detailed maps that had been only drawn before for the regions of military interest (775). As usual during the Old Regime, the administrative division of the territory prevents us from having a clear view of the whole network (only the maps of the roads of the Pays d’élection, those of the Province d’état remained in the provincial archives because they depended from another administration). A copies of the maps was sent to the king from 1752 to 1771 but some of them are somewhat inaccurate because entire provinces have not communicated the maps of their roads (785). There were a regular service of coaches on all the main roads from and to Paris (787). These coaches never crossed more than 680 km (Paris-Toulouse), for longer distances (such as Paris-Marseille) one had to change coach once or twice. The coaches have bad suspensions and travel slowly (50km a day at most), it means that t take over 11 to go from Paris to Strasbourg, 13 to Bordeaux and 15 to Toulouse. A few routes have a faster system (coaches with better suspensions, more relays which allows horses to gallop and travel longer each day). They go more than twice faster (Paris-Lyon, 470km, in 5 days) (788). In 1776, Turgot introduces faster coaches and allow them to use the numerous and well equipped royal post relays. The whole country was reached by the new light coaches and traveller save half or two third the time they spent travelling with the old system. Orléans was 2 and a half day away from Paris in 1765 but only one in 1780 (789). Marseille was reached in 8 days, Toulouse in 7 and Strasbourg in 5. Some regions nonetheless remain untouched by the progress. Some are too far from Paris (Alps, Pyrenees, Languedoc) and other seem simply stubbornly opposed to transportation (Bretagne, Auvergne). On the other hand, intra-and inter-regional linkages are flourishing in some parts and many coaches travel the same roads as the fast and modern ones but slower and for a lesser price. The structure created by the monarchy remained untouched by the following regimes and still represent the blueprint of the French road system in the 21st century (791). Another important player in the construction of the typical tree lined avenues we associate with France was Pierre-Marie-Jerome Tresaguet and this is what I found out about him. In France, Pierre-Marie-Jérôme Trésaguet is widely credited with establishing the first scientific approach to road building about the year 1764. He wrote a memorandum on his method in 1775, which became general practice in France. It involved a layer of large rocks, covered by a layer of smaller gravel. 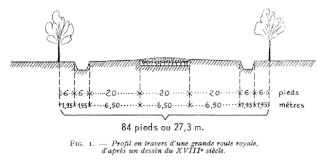 The lower layer improved on Roman practice in that it was based on the understanding that the purpose of this layer (the sub-base or base course) is to transfer the weight of the road and its traffic to the ground, while protecting the ground from deformation by spreading the weight evenly. Therefore, the sub-base did not have to be a self-supporting structure. The upper running surface provided a smooth surface for vehicles, while protecting the large stones of the sub-base. Trésaguet understood the importance of drainage by providing deep side ditches, but he insisted on building his roads in trenches, so that they could be accessed from the sides, which undermined this principle. Well-maintained surfaces and drains protect the integrity of the sub-base and Trésaguet introduced a system of continuous maintenance, where a roadman was allocated a section of road to be kept up to a standard. Thus it is clear that there was plenty of road building before Napoleon and from the drawing we can see trees along the edge of the road were part of the process but there is no mention of why. In one book I read about the subject ( The Discovery of France: Graham Robb Picador 2007) the author suggests they were planted simply because they looked nice. In fact throughout history they have not been well regarded by everyone. In days gone by the trees provided good cover for highwaymen and allowed them to spring out and surprise their victims. Also the roads had ditches along the edge which was to ensure good drainage so the carriage way did not become waterlogged and boggy but the trees tended to block up the ditches with fallen leaves and their roots would enter the ditch so that drainage was less efficient. Another negative effect of the trees was and still is that the surface of the road often remained wet long after a period of rain or remained covered with snow and ice long after neighbouring areas had thawed out, thus making progress either for horse drawn vehicles or for motorised vehicles more hazardous. In the modern era the trees have been responsible for many accidents causing injury or deaths which would not have happened had the trees not been there. In many areas the authorities are removing the trees because of the problems they cause with modern fast moving vehicles. However as is often the case there are counter arguments and the lines of trees do provide good habitats for wild life and in a similar way to English hedgerows they do provide corridors for the movement of wildlife. This topic is covered in an article from the independent http://www.independent.co.uk/news/trees-that-shaded-napoleons-troops-face-their-waterloo-1092916.html Again the myth that Napoleon is responsible for the tree lined roads is perpetuated in this article. Recently the Agriculture Minister, Jean Glavany, has joined the campaign to have the trees cut down. Well I think the drinking message is being heard. I was stopped recently and was OK. I think there are more police about and more speed checks. As collision avoidance and driverless technology takes over in cars, there will be almost no more human driver error. Automobile accidents will be almost entirely eliminated. This is one place where technology will greatly help increase safety, efficiency of transportation, and allow keeping the trees. Plus, since you won’t have to drive a car, you will be able to spend more time enjoying the view of the trees and the beautiful French countryside. I know what you mean,its a bit like a strobe effect, which can cause epileptic fits. Thanks for an interesting read. Do you happen to know what type of trees line the roads? Thanks for the research. We took a guided tour via private taxi through Provence recently (primarily in the Vaucluse department); our guide espoused the Napoleonic “shade for his army” etymology, which seemed a little far-fetched to me at the time. The tree-lined boulevards are simply gorgeous, I must say. Would be a shame to lose that iconic bit of beauty. At the same time, the local roads in Provence are exceedingly narrow. Maybe cut down trees on ONE side of the road and widen them on that side?! Yes, I too like the look of them and in some places you now get dual carriageways with trees on one carriageway and the opposite route is open. The age of the current trees would tell us when they were planted. When were the current trees planted? Who replants new trees and what records are there of the plantings? In the coming age of driverless cars, the safety of driving will increase enormously and there will be almost no accidents caused by driver error. And there will be more use of shared cars so there will be less density of cars on roads. All of these are factors that bode well for keeping the trees.